A stylised depiction of the Blue and Grey exchanging close range volleys. I have decided to fight a small ACW action using my block armies and map sheets from the Axis and Allies selection I own. The playing area will be 14 x 10 hexes – slightly larger than the usual Command and Colours 13 x 9 playing area - and I anticipate using a ratio of 3:2 in favour of the attackers versus the defenders. The defenders will have some fieldworks so on the face of it you could be forgiven for thinking that the attackers are going to struggle to prevail. This is intentional as I want the attackers to go for one of the flanks of the defenders position. The main attack should really be by way of a holding engagement whilst the flanking force attempts to turn the defender’s position. This is a common enough tactic and indeed, during the Atlanta campaign of 1864 happened many times to Johnston’s Confederate forces opposing those of Sherman as he was continually flanked from one defensive position to another. 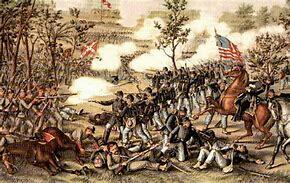 Ultimately this led to Johnston’s dismissal and replacement by Hood shortly before the fall of Atlanta. The forces I will use will be fairly modest and at his stage I thinking along the lines of the Union having 6 x 4 infantry, 2 x 3 Cavalry and 2 x 3 artillery whilst the Confederates weigh in with 4 x 4 Infantry, 1 x 3 cavalry and 2 x 2 artillery. I have made the Union artillery stronger rather than having an extra unit as I believe this would give it too much of a tactical advantage. Having 6 strength points split between two units merely means that they will last longer. Taking the strength points for each side (to include the 2 each for the respective commanders) the Union come in at 39 with an exhaustion point of 13 whilst the Confederates have 25 with an exhaustion point of 9. For the rules I shall be using Bob Cordery’s Portable Wargame 19th Century set. This game will also have the distinction of being number 52 fought in the man cave and I was quite embarrassed to see when the last one was fought! For a little period flavour I thought I would include the following although strictly speaking at the time of the action I shall be fighting Sherman has yet to march to the sea as Atlanta has yet to fall. 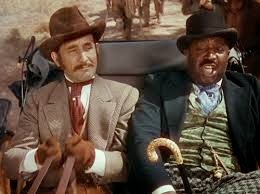 The 'carpetbagger' scene from the film Gone With the Wind - this is where I first the tune below. There are several variants of this song - some of which may not be described as politically correct these days so I have opted for the sanitised version! Ah, I remember singing that song while reenacting the Battle of Fort McAllister. I think I have several versions downloaded. Always rousing when playing an ACW game. Many thanks for the link - it was very helpful, especially the background to the fort and the naval attempts against it. It is great song to 'get you in the zone' so to speak.